New Orleans City Council Member James Gray and his wife, Ernestine, in their New Orleans East home. New Orleans City Council Member James Gray looks out at what used to be called The Plaza before Hurricane Katrina. This was a multi-city-block shopping and commercial development in New Orleans East. Ten years ago, shortly after the floodwaters subsided, James Gray stood in the ruins of his New Orleans home and tried to salvage what remained of his belongings. They fit inside a handbag. “I don’t know if my wife will ever get over that,” Gray said recently. But Gray and his wife have since restored the New Orleans East home where they have lived for more than 20 years. Most of their neighbors have returned, too. And Gray, who now represents the neighborhood on the City Council, points to other evidence of rebirth in a district that has long been home to much of the city’s black middle class: a gleaming new hospital, which opened last year; new schools open or under construction; national chains such as Wal-Mart and CVS that are returning after years of absence. New Orleans has emerged from a decade of destruction and rebirth as a changed city, smaller, wealthier and more diverse, but also more unequal than it was before the storm. Many locals, black and white, speak with pride about the city’s rejuvenated tourism industry, its ambitious (but contentious) overhaul of the school system, and the influx of educated, socially conscious young people who have turned New Orleans into a hub of entrepreneurship. But they also worry about rising rents, gentrification and the erosion of the culture that made New Orleans special in the first place. But it isn’t just that there are fewer black New Orleanians; their place in the city’s economic fabric has fundamentally changed. African-Americans have long accounted for most of the city’s poor, but before the storm they also made up a majority of its middle class and were well represented among its doctors, lawyers and other professionals. 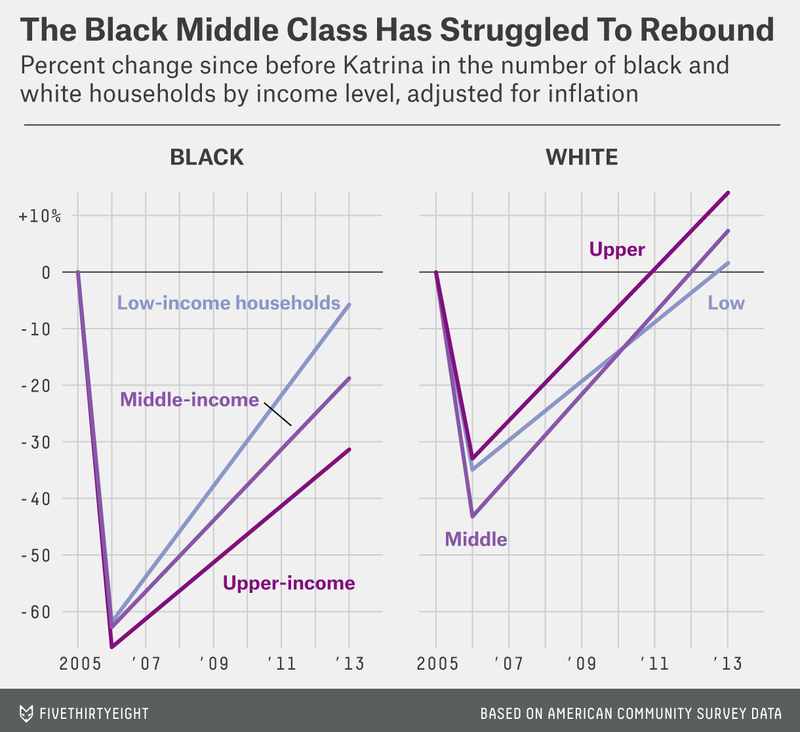 After Katrina, the patterns changed: The poor are still overwhelmingly black, but the affluent and middle classes are increasingly white.4 Moreover, what remains of the black middle class is graying. Many of the middle-class African-Americans who returned to the city were retired or nearing the end of their careers; younger black professionals, meanwhile, fled the city in search of better opportunities elsewhere. The aging of the black middle class stands in stark contrast to the influx of young, educated — and overwhelmingly white — professionals who have reshaped the city in the years since Katrina.5 Between 2011 and 2013 alone, New Orleans added nearly 10,000 college graduates under age 40. Many of them have been drawn by the thriving startup scene that emerged in the wake of the disaster; at a time of declining entrepreneurship nationally, New Orleans now has one of the highest business-formation rates in the country. The city has been a particular magnet for “social entrepreneurs” looking to apply a tech-savvy, business-oriented approach to fixing problems that range from failing schools to the lack of grocery stores. Propeller, a business accelerator focused on socially oriented startups, grew out of the spontaneous neighborhood volunteer efforts that sprung up after Katrina and now attracts entrepreneurs from around the country. Andrea Chen, the group’s co-founder and executive director, said Propeller looks for projects that will fill needs in the community, including the black community. But however good the newcomers’ intentions, they have brought with them a wave of gentrification that has put added pressure on the already struggling black middle class. Housing costs in parts of New Orleans now rival those in expensive coastal cities like Boston and New York, despite typical incomes that are far lower. New Orleans ranks among the worst cities in the country for housing affordability; 37 percent of renters spend more than half their pre-tax income on rent and utilities, according to The Data Center, a New Orleans research group. “The squeeze is on in a big way,” said LaToya Cantrell, a City Council member who represents some of the areas hit hardest by gentrification. She said she worried about rising rents pricing out the artists and musicians who are so central to New Orleans’s culture — and its tourism industry — while eroding the African-American community’s tradition of having multiple generations living together or in close proximity. Not all the young entrepreneurs are gentrifiers from out of state. Larry Irvin, chief executive of the education startup Brothers Empowered to Teach, was born and raised in the city. Like many of the city’s ambitious black residents, he planned to “get the hell out of New Orleans as fast as possible” to escape the violence and lack of opportunity that surrounded him growing up. Irvin was well on his way to succeeding: When Katrina struck, he was 80 miles away in Baton Rouge, where he was a junior at Louisiana State University. His father and more than a dozen family members fled the storm and ended up spending two semesters crammed into the off-campus apartment Irvin shared with two roommates. The experience, he said, taught him resiliency — and ultimately led him to return to help rebuild New Orleans when he graduated. Brothers Empowered to Teach, a 3-year-old nonprofit organization, aims to recruit black men into teaching in the hope of providing positive role models for black boys. Just 3 percent of New Orleans teachers are black men, Irvin said. He and his co-founder, Kristyna Jones, speak passionately about the need for black men to help shut down the “school-to-prison pipeline” that leaves so many young African-Americans dead or in jail. Irvin and Jones see their organization as a small step toward reviving the city’s black middle class. Yet for all his sense of mission, Irvin says not much has changed since the storm. The murder rate remains among the highest in the country. Opportunities for good jobs remain scarce. Fully 35 percent of black men under 25 in New Orleans are neither working nor in school, compared with 5 percent of white men in that age group. More often than not, Irvin said, striving for a better life still means leaving town. New Orleans leaders stress that Katrina exposed the city’s problems; it didn’t create them. High crime rates, a broken school system and a lack of good jobs, among other factors, were driving away middle-class residents long before the storm struck. 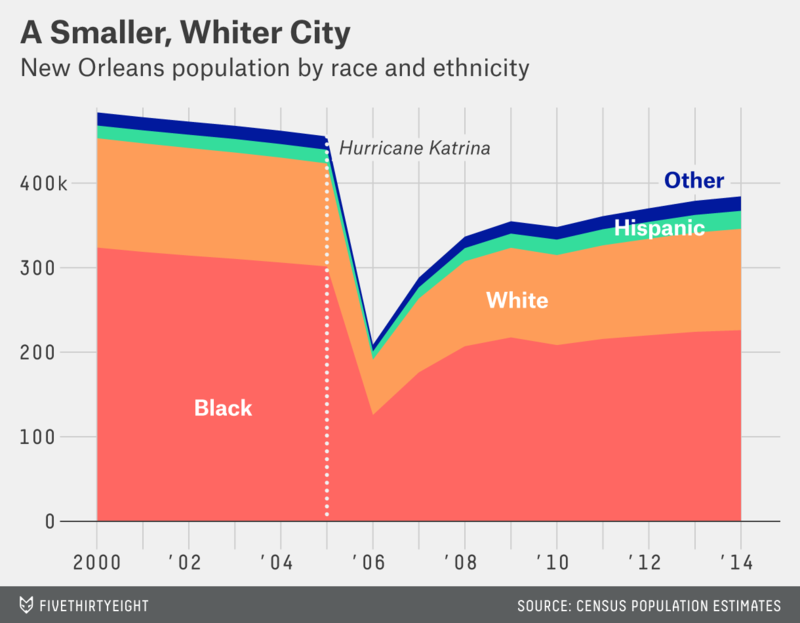 Gray, the City Council member, said the black population would be smaller today had it not been for Katrina, and while that seems unlikely, it is true that New Orleans lost more than 20,000 black residents between 2000 and 2005. “New Orleans East and all of New Orleans was in decline when looked at by several measures before the flood,” Gray said. The diverging paths are to some extent the inevitable consequence of decades of inequality and segregation. The city’s traditionally white neighborhoods are largely built on high ground and fared comparatively well in the storm. Black neighborhoods, even relatively affluent ones, tended to be built in low-lying areas where the damage was far worse. Moreover, as in most of the U.S., even well-to-do African-Americans were much less likely than their white counterparts to have the kind of wealth — their own savings or access to money from relatives — that could help them rebound quickly after a disaster. Further compounding the problem was the 2008-09 recession, which hit African-American families particularly hard across the country. But experts also point to policy decisions that hampered the black middle class’s recovery after the storm. As author Gary Rivlin explained in detail in a recent New York Times Magazine article,7 the federal Road Home rebuilding program effectively discriminated against black families by basing payments on the appraised value of damaged properties (which was often far lower in black neighborhoods), not on the cost of repairing them. That left thousands of black families without enough money to rebuild properly. Local decisions also played a role. Shortly after the storm hit, the Louisiana State Legislature voted to take over the New Orleans school district and fire all 4,600 teachers, along with hundreds of other staffers. The effect of that decision on the schools has been the subject of an intense and still unresolved debate. But one effect is clear: Thousands of mostly black school employees lost their jobs, and although some were rehired, many more were not. 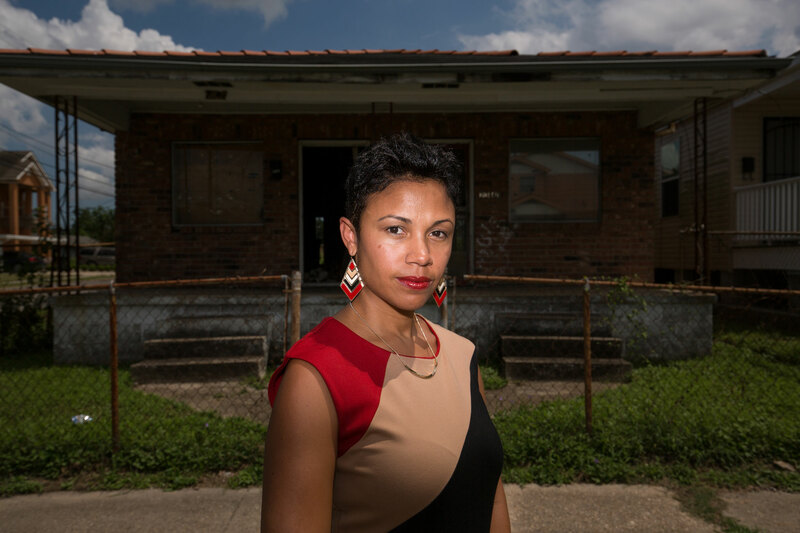 Erika McConduit-Diggs, president of the Urban League of Greater New Orleans, in front of a home in the Upper Ninth Ward. Wright and other critics also offer a broader critique of the recovery effort, which they say has prioritized the tourism industry and the gentrifying entrepreneurs above the needs of the black majority. They point, for example, to a lack of new affordable housing, particularly in areas accessible by public transit, and to the still-unrepaired infrastructure far from the gleaming new hotels and high-end restaurants. “From day one, for many children the deck is stacked against them,” Landrieu said at the time. McConduit-Diggs of the Urban League said the storm may have reduced the black population, but it increased the civic engagement of those who remain. And she said New Orleans has one other big advantage: a diaspora that desperately wants to return to the city, if they are convinced it is safe and offers educational and economic opportunities for their children. A native New Orleanian, McConduit-Diggs was nine months pregnant when she fled the city ahead of Katrina, and she didn’t return for three years. Her sister and her husband just moved back last week. “There is something incredibly special and personal about this city that even with its challenges, people still want to return,” McConduit-Diggs said. According to American Community Survey data through 2013, the latest year available. Comparing pre- and post-Katrina economic statistics is tricky because the national economy was weaker in 2013 than in 2005. But even accounting for national trends, black families in New Orleans have seen minimal economic progress since before the storm. In fact, the number that didn’t return is probably larger, but the exact figure is impossible to know because census data doesn’t distinguish between residents who returned to the city post-Katrina and those who moved there for the first time after the storm. These figures are based on the official population estimates from the Census Bureau, which differ slightly from American Community Survey numbers. There is no official definition of “middle class.” One common approach is to define the middle class as households earning between $35,000 (about two-thirds of the federal median) and $100,000 (about double the median), adjusted for inflation. According to American Community Survey data, in 2005, 59 percent of New Orleans households in that income range were headed by an African-American; in 2013, the share was just under 50 percent. Among households earning $100,000 or more, the black share has fallen to 26 percent from 35 percent before Katrina. Using different thresholds, adjusting for household size or making other methodological tweaks changes the numbers but not the overall pattern. According to American Community Survey data, 81 percent of college graduates under 40 who moved to New Orleans from out of state in 2012 and 2013 were white. For the years 2006 and 2013, the figures are based on households in Orleans Parish, whose boundaries match the city of New Orleans’s. The 2006 calculations are a bit more complicated. The annual American Community Survey microdata (anonymized records of individual survey respondents) lists where people live by their “Public-Use Microdata Area” (PUMA), which are communities or sections of communities that, for privacy reasons, must have at least 100,000 residents. Ordinarily, PUMAs in the New Orleans area don’t cross the city’s boundaries, so researchers interested in the city can just look at all the PUMAs inside of it. But Katrina drove away so many people that two of the New Orleans PUMAs fell below the 100,000-resident threshold. So in the years immediately after Katrina, the Census Bureau combined those two PUMAs with one across the border in neighboring Jefferson and Plaquemines Parishes. Because the new, combined PUMA crosses parish lines, it’s no longer possible to identify who lives in New Orleans proper. This approach has one obvious source of error: The New Orleans population changed dramatically after Katrina, which could have made the prediction model less reliable. But the results of the model closely match data published by the Census Bureau (the bureau gets access to more detailed data on where each household lives). Still, the 2006 data point should be considered an approximation, not a precise value. Rivlin also is writing an article about New Orleans after Hurricane Katrina for FiveThirtyEight. I attended the NOLA for Life conference at Landrieu’s invitation (and FiveThirtyEight’s expense) and spoke on a panel.